Berlin summer is HOT HOT HOT!!! What to do in Berlin during these extreme hot days?? Of course it is a good idea to go for a swim. Just read our previous blog post on swimming pools and lakes. But beside swimming there are other refreshing activities. We have listed a couple ideas for you in this top 5! enjoy your summer vacation in Berlin! Berlin knows a lot of big and green parks. It is extreme hot today and it is gonna be hot the coming days too, but if you stay in the shade you will be fine! Close by the hostel you find the Kollwitzpark, named after the famous left-wing anti-war artist Käthe Kollwitz. A bronze statue of whom is also to be found at the heart of the park. It is a small but lively park, with two small play grounds and a green lawn in the middle. twice a week there is a organic market here. Another nice park is The Leise park, located next to the cemetery st. Marien/st. Nicolai. It is a brand new park and actually build upon former cemetery ground. A few grave-stones are randomly located in the park and remind you of the former use of this piece of Berlin. The park has a lot of big trees, so there is a lot of shade. Perfect hideout during these hot days. the days are long and the nights are hot! if you want to see a great movie with English subtitles or in English language go to the open air cinema kreuzberg!! @ Marianneplatz 2!! After watching a movie you can stay in Kreuzberg to explore this cool neighbourhood. A lot of nice bars and clubs are within walking distance from the open air cinema! why not just stay at the hostel?! We have a relaxed big garden with lots of shade! There is a family sized BBQ you can use! So just get some ingredients from the shop down the road and start your BBQ- party!! on the water its more cooler than anywhere else in the city, so why not rend yourself a boat and have fun! 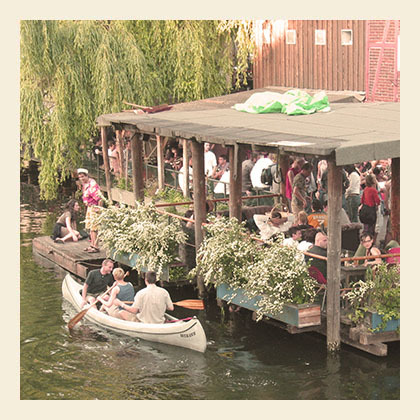 for instance you could rend a paddle boat @ Spreeboote It is located close to S-Bahn station Rummelsburg, easy to reach by public trasnport! Or you can rent a small boat at the Schlachtensee, which is also a really popular lake for swimming and sunbathing! easy to reach, there is a S-train station Schlachtensee. For help on how to get there and back, please ask us at the reception!! 5. The Volkspark am Friedrichshain. is a very big park with a lot of different things to see and do. There is a fairytale-fountain, a sportpark, a beach-volleyball-area and a open air cinema! It is perfect for jogging, pickniks, or just a nice and relaxed strawl. In the middle youll find Friedrichshains highest hill, which provides a 78-metre high view over Berlins flat terrain. The hill was actually man-made to cover up a destroyed anti-aircraft bunker from World War II, as well as several tonnes of bombed out rubble.